Pretty much, I got nothing this evening people. Just a whole bunch of random musings and startling realizations. . . but since my computer friends are my best friends, I'll regale you with my crazy thoughts. First of all, Celia Fae, thanks so much for the grocery delivery tip. Plus, yes, I could watch some TV on my computer, but it couldn't always work like I want strictly due to the location of the all-powerful computer. (It's in my bedroom) Anyways. It's in my bedroom, and DadGuy can't sleep if I'm sitting here, typing. It's quite a predicament. Plus, sometimes, I'm even nice enough to let him get on here for a bit, after all, he is going back to school, and he has to retake the GMAT and that means he has to study every so often. (*sidenote* with my last pregnancy I was bedridden forEVER and I have an uncontrollable thirst for said beverage. anyhow. my kids used to get all freaked out every time I asked for a pop (or soda for you purists) Anyhow. THEY thought that Dr. Pepper was a REAL doctor. And every time I was all "Hey, I need a Dr. Pepper" they would cry and tell me not to go to the hospital. . . It was pretty funny. . . except for that it was so sad. . .
What else? What else? Hmmmm, oh, once upon a time, when I was thin and gorgeous, I had this beautiful blond hair that cascaded down my back. Then I went to beauty school and discovered how much I love haircuts. That being said, I cut off all my hair not too long ago, and now I'm noticing how ridiculously fast my hair grows because I already need another cut, but at the same time, I kinda want to grow it back out. It's a very taxing situation, you see. Have cute short hair, or long pretty hair. (seriously, those are the options. Have you ever seen someone with cute, long hair? NO!! Long hair can be pretty, but it can't be cute. . . True story.) It wouldn't be such a problem if I was a little bit thinner, but seeing as how I just had a baby 5 months ago, (and 1 year ago, and 2 and 3 years ago as well) I'm quite fluffier than I should be. Which brings me to here. I really want a quadruple stroller. But all the ones I've seen are lots of $$$$$$$$$. And that's definitely not something I have right now. I have this much $. I'd even settle for a triple stroller. I have a double. Heck, I have two doubles! 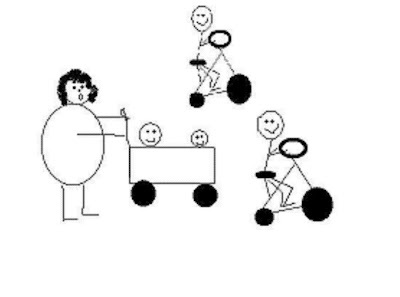 But somehow, when I have the babies in the double, and the others on their bikes, it's a recipe for disaster. Too many directions, too fluffy of a mommy to chase them down, not a pretty picture I tell you. . . not pretty. . .
Stop laughing. You know it would be funny to see, just not funny to BE. I said stop laughing. That's it. I'm going to bed.